"The tang from the Dijon, freshness from the lemon, and liveliness when paired with watercress makes this recipe a MUST! This recipe tastes best when paired with wheat bread, watercress and avocado!! But I can eat it by itself"
Place egg in a saucepan and cover with cold water. Bring water to a boil and immediately remove from heat. Cover and let eggs stand in hot water for 10 to 12 minutes. Remove from hot water, cool and peel. For faster cooling, place the eggs in an ice bath before peeling. In a medium bowl, stir together the mayonnaise, Dijon mustard, yellow mustard, lemon juice and green onions. Chop the eggs into big chunks and mix gently with the dressing. Season with salt and pepper. I followed the recipe exactly and it turned out very good! This will be the only way I prepare egg salad from now on. Thanks! 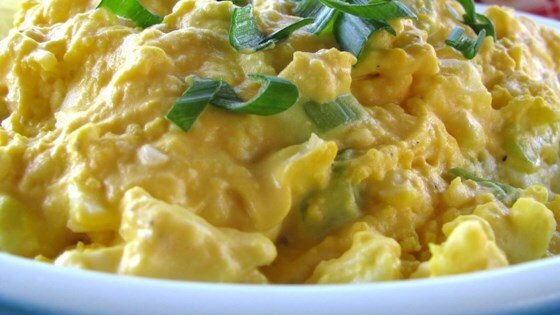 This is wonderful, easy egg salad. Sometimes I replace the green onions with fresh chives. It's delicious both ways. We'll be having it in mini cream-puffs for an upcoming tea! My husband loves this egg salad recipe! I wouldn't change a thing. I used a quarter of a lemon - juice. and 8 eggs. I did add Cayenne pepper for a kick AMAZING EGG SALAD. PEOPLE DO NOT ADD HALF A LEMON JUICE THAT WILL KILL IT.